THE SUNDAY TIMES AND #1 INTERNATIONAL BESTSELLER - with a new foreword by Silicon Valley legend Marc Andreessen. 'For my money, a better book about Jobs than Walter Isaacson's biography' New Yorker'A fascinating reinterpretation of the Steve Jobs story' Sunday TimesWe all think we know who Steve Jobs was, what made him tick, and what made him succeed. The young, impulsive, egotistical genius was ousted in the mid-80s from the company he founded, exiled from his own kingdom and cast into the wilderness. Yet he returned a decade later to transform the ailing Apple into the most successful company the world had ever seen. 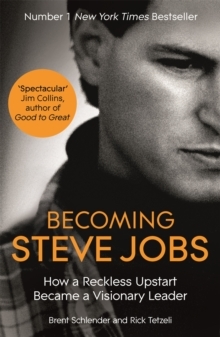 The first comprehensive study of Jobs' career following his dismissal from Apple, written with unparalleled access and insight, BECOMING STEVE JOBS offers a startling new portrait of the most important business figure in modern history. The most intimate biography yet of Jobs, written by the journalist who knew him better than any other, BECOMING STEVE JOBS draws on recently discovered interviews that have never before seen the light of day, and answers for the first time the most pressing questions about what made this legendary business leader such a success. 'Brent Schlender and Rick Tetzeli render a spectacular service with this book, giving fresh perspective onSteve Jobs' journey from inspiring but immature entrepreneur into an inspired and mature company-builder. Most important, they capture Jobs' resilience, his refusal to capitulate, his restless drive to stay in the game, his voracious appetite to learn-this, far more than genius, is what made him great.Becoming Steve Jobs gets the focus precisely right: not as a success story, but as a growth story. Riveting, insightful, uplifting-read it and learn!' Jim Collins, author of Good to Great'BECOMING STEVE JOBS is fantastic. After working with Steve for over 25 years, I feel this book captures with great insight the growth and complexity of a truly extraordinary person.